Shri G.P. Goyal is the President of Mitra Jyothi Trust. He is a senior businessman in the transport and real estate industry. He is from Hisar, Haryana and graduated from BITS, Pilani. He later moved to Bangalore and looked after his family business “South Eastern Roadways Ltd” for around 18 years along with his brothers. Eventually he started his own business in real estate and has been running it successfully till date. Shri. Goyal is primarily responsible for supporting and encouraging Ms. Madhu Singhal to start Mitra Jyothi. Ms. Madhu Singhal had just moved to Bangalore from Haryana in the late 80's. She was young and energetic and full of ideas. With guidance and moral support from Shri. Goyal, young Ms.Madhu Singhal started Mitra Jyothi with humble beginnings. 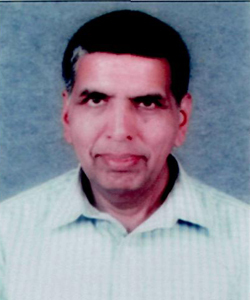 He has ever since been a big pillar of strength to Ms. Madhu Singhal and Mitra Jyothi. He is a philanthropist at heart and involves himself actively in various social causes.